This is the last day where all windsurfers and kiteboarders can sign up for the 25th International Funboard Cup in Boracay. International riders from Asia, Europe and Australia will compete the next 5 days in windsurfing and kitboarding diciplines as slalom, speed and freestyle. 8 years ago world-cup riders Dan Ellis (GRB), Gonzalo Costa-Hoevel (ARG), Lucia Horwood (GBR) and newcomer Connor Baxter (USA) have met at Bulabog Beach to compete. The forcast predict stong wind for the end of this week. 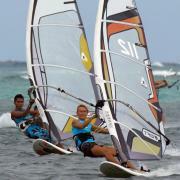 On January 21-26, 2013, the Boracay International Funboard Cup celebrates its 25th year. A homegrown Boracay event which started 25 years ago as a small gathering of windsurfer friends has turned into a spectacular annual international watersport and the the most popular windsurfing and kiteboarding event in Asia.The competition has made Bulabog Beach to Aisa's most famous kite- and windsurfing spot and attracts yearly more enthusiastic windsurfers and kiteboarders around the world. More than 100 participants worldwide are expected to participate the year. Funboard Center Boracay wishes all our friends, guest, kiteboarders and windsurfers, potential costumers a wonderfull Christmas and a Happy New Year. Father Christmas arrived early on the Philippines with a present of good wind. The season ends with perfect windy days and the forcast promised more than 40 knots. We all hope this a good sign of the wind to come the following year and gives all kiteboarders and windsurfers at Bulabog Beach a big smile. The Flying Carpet from Nobile - the ultimate beginner board. The Flying Carpet von Nobile is a must for every kite school. It's longer than the shortest kite instructor from Funboard Center Boracay and guarantees every kite student a save boardstart and the first floating ride experiences. All advanced kiteboarders go kiteboarding when the others are still waiting for the wind. Unmatched upwind performance, perfect grip and easy maneuvering benefits with a pleasant ride. It also makes the Flying Carpet easier and more fun to ride than any other kiteboard of it's size. Read more about The Flying Carpet from Nobile - the ultimate beginner board. Only a few days to go for the 10th anniversary: in 2003 Funboard Center Boracay celebrated his grand opening and melt windsurfers and kiteboarder from all over the world at Asien's best windsurfing and kiteboarding spot on Boracay Island. Unusual non-windy days at Bulabog Beach after Taifun Bopha. Luckily he did not hit Boracay Island and all water sport enthusiasts could experience the greatest windsurfing and kiteboarding spot in Asia in a very different and relaxed atmosphere. Crystal clear and flat water were the perfect moment to enjoy the SUP and explore Boracay. At the same time kiterboarders and windsurfers stay in shape while waiting for the right coditions for the next kite- or windsurfing session. Windsurfers ahead: Antoine Albeau, the French windurfing speed master, has almost reached the classic mark of 100km/h ( 53,99knots) over a 500m course and has set a new Speed Windsurfing Record of 96,39 km/h on the 9th day of the 2012 Luderitz Speed Challenge in Namibia. He has now three more days to reach the barrier. Two month vaction ahead in Asia which also includes 5 weeks of windsurfing at Simone's Funboard Center Boracay in the Philippines. I met Simone many years ago in Greece where I used to have a windsurfschool. As we both are passionate windsurfers we stayed in touch over the years and met on different spots just to get a good ride together.